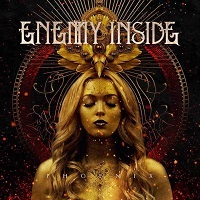 ENEMY INSIDE is a German Dark Rock/Modern Metal female fronted band out of Germany. Having formed in 2017, “Phoenix” marks their debut full length album. Eleven tracks are featured on this album, all contributing to the theme that “We all carry our greatest enemy inside us.” The album starts with their first single, “Falling Away”. Melodic vocals are showcased over aggressive riffs which make for an interesting juxtaposition. It is a solid song that was a good choice as their first single to introduce themselves to the world. The second song, “Bleeding Out” is my personal favorite. Catchy riffs along with catchy vocals make for a song that will stick in your head long after the album has stopped. Nastassja Giulia shows a wide vocal range throughout the song. This song also has an oriental element thrown in the background. It is a very layered song that is a pleasure to listen to. The fourth song on the album, “Lullaby” has a singsong quality to it. Natassja Giulia uses a much more mellow and soft tone for most of the song. Toward the end she picks back up with intensity and brings her range to the higher side. The overall tone of the song has a haunting feel. “Doorway To Salvation” is the fifth song on the album. This song features Georg Neuhauser (lead singer of the Austrian symphonic power metal band SERENITY) who gives the song a lot of depth. His voice is very pretty but has a roughness to it that lends great opposition to Natassja Giulia’s clear voice. This song also features a beautiful guitar solo whose tone and quality add to the romantic feel of the song. “Angel’s Suicide” is yet another very catchy song. The vocals are very bright and clear throughout the song. “Death of Me” follows with a wide variety of vocals. She starts out very mellow, soft and low and quickly changes it up with clear, highs and continues this pattern of lows and highs throughout. The chorus has a gritty feel to it. This song features another epic guitar solo. The drums throughout this song are subtle yet powerful especially toward the end of the song where they stand out. The ninth song on the album, “Halo" is a brighter, higher range song with a catchy chorus. Momentum is slowed down with “Dark Skies”, which is a very pretty, haunting ballad. The piano starts out the song and then accompanies Natassja’s mellifluous voice. The guitar picks up the somber feel here and there and then stands out with another guitar solo. The drums on this song are very steady throughout and help carry the song. The album ends with a bonus track of “Doorway To Salvation” without the featured vocals of Georg Neuhauser. Having only Natassja Giulia’s vocals in this version of the song gives it a brighter quality. ENEMY INSIDE’s debut album “Phoenix” is full of breathtaking vocals, melodic guitar solos, and expressive lyrics. The theme of this album is “We all carry our greatest enemy inside us. One that we can’t see coming, from whom we can’t hide, who can bring our weaknesses to the light”. The lyrics throughout the album mirror this idea of inner struggle between light and dark, good and evil, friend and foe.